Brooklyn Community Board 1 unanimously endorsed DOT’s bike lane plan for the Metropolitan Avenue Bridge. It took a while to reach this point — the board repeatedly delayed an endorsement for more than two years. The project will add painted bike lanes in both directions over the bridge, which connects Bushwick and Ridgewood [PDF]. DOT has revised the design multiple times since first presenting to the board in June 2014. 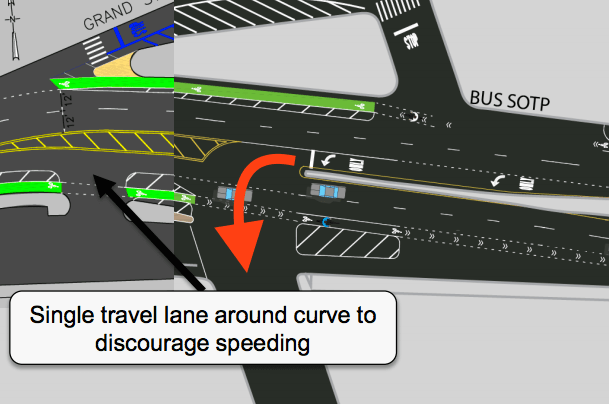 Most recently, CB 1 voted 18 to 8 last month to table the project, demanding that DOT do something about a supposed “left turn of death” from westbound Metropolitan Avenue onto Varick Avenue. The intersection doesn’t have a record of high injury rates, however. In the past three years, two cyclists have been injured at the location (it’s not clear if left turns were involved), and no one has been killed there according to Vision Zero View, which contains crash data going back to 2009. Transportation committee chair Vincent Gangone said last night that he was recommending the plan because DOT had committed to exploring banning the left turn. Gangone explained that he, CB 1 Chair Dealice Fuller, and District Manager Gerald Esposito had met with DOT officials. He then read the text of a letter from the agency promising to return to the transportation committee in November or December once it has fully studied the potential impacts of the proposed left turn ban. Throughout the meeting, Gangone and Esposito stepped out of the room multiple times to speak privately with board members. The motion to approve the plan was endorsed with zero discussion from the board. Ryan Kuonen, who sits on CB 1 and supports the project, said concerns about the turn were merely a delay tactic from the board’s leadership. DOT could have proceeded with the project at any time, since community board votes on street projects are advisory, not binding. Now that CB 1 has unanimous voted in favor, there’s really nothing holding DOT back, though it may be too late to fit the project into this year’s construction season. The agency did not respond to Streetsblog’s inquiry regarding the timeline for implementation. Update: An agency spokesperson says DOT will begin implementation of the Metropolitan Avenue bicycle route this month. All that just for some paint on the street… Vision Zero in NYC is a joke. If they paint it now will the buffer on the inside of that curve last until next summer? I still don’t see any reason why there needs to be two lanes of traffic here in either direction. Because inbound traffic turning right after the bridge backs up onto the bridge, that’s why. I see the bus sotp is still there. Why the curbside bike lane AND sharrows westbound across the bridge? I’ve never seen that before.